The Graveyard Rabbit: Meet Nancy Pattenden, Author of "Graveyard Rabbit Blog For The York Region Branch OGS Cemetery Transcripts, Etc." 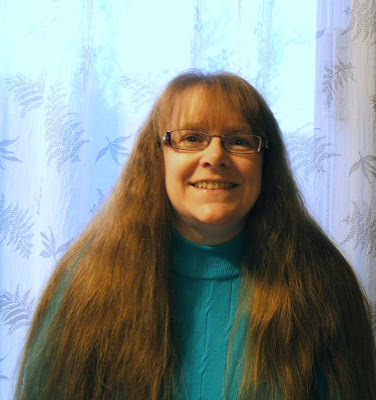 Meet Nancy Pattenden, Author of "Graveyard Rabbit Blog For The York Region Branch OGS Cemetery Transcripts, Etc." Graveyard Rabbit Blog For The York Region Branch OGS Cemetery Transcripts, Etc. I suppose my interest started when I got into genealogy. Cemeteries are a good place to start gathering information for family history. About four years ago I joined the York Region Branch of the Ontario Genealogical Society (OGS), and they had an opening for the Cemetery Co-ordinator position. That position is responsible for the cemetery transcripts, which are publications containing all the information on every headstone in the cemetery. Word for word, error for error, and any symbols or etchings of note. I volunteered for it, and have become more interested in cemeteries since. 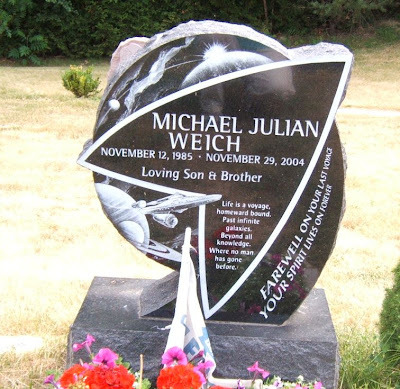 There are some very creative stones now, and it’s interesting to see how headstones and the graphics on them have changed. There used to be only a few different styles, and the verses and symbols were pretty standard. Now you will find grave markers in all different shapes and sizes, containing the standard religious symbols, sketches, and actual photographs, each symbol depicting the lives and interests of the person buried there. I’ve seen a stone shaped like butterfly with a photo of a cat at the tip of one wing and a photo of a dog on the tip of the other, etchings of bingo cards, even one stone with the person’s fire department badge embedded into it and protected with plexi glass. I’ve collected hundreds of photos of the various stones, both old and new. I’ve even started writing a cemetery book. It will contain information on all the cemeteries and burials in York Region that we know of, along with some local history, and information on any prominent people in that cemetery. The pictures I’ve taken over the past few years will come in quite handy for that. My interest has also spread to the preservation of cemeteries that are in danger of being destroyed by developers. Don’t let anybody tell you that you can’t fight a developer and win. Several years ago, the OGS joined forces to help protect a small family cemetery. There are only five stones, but that was five stones too many to relocate, as far as the descendants were concerned. It took a lot of money and a few years in court, but the battle was won. I was able to attend the re-dedication of the new Clendenen Cemetery in Markham on November 10, 2007. The ceremony was attended by the Mayor, a Town Councillor, local Minister and even two representatives from the developer. They have turned it into a lovely little parkette. I guess my favorite would be the Aurora Cemetery. It’s in the town where I grew up, and has a fair number of my relatives there. It also contains some pretty cool stones. I’m rather fond of the one with all the Star Trek symbols on it. Even the shape of the stone is Trekkie. 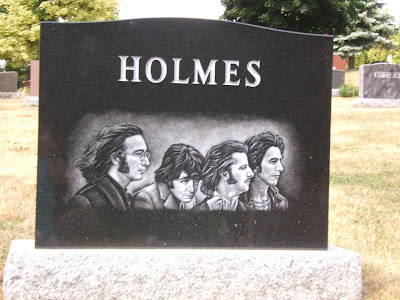 Close to that one is a large stone with a beautiful etching of the Beatles on the back. Another stone is a replica of the Empire State Building. I believe it is about 10 feet tall. I wrote an article about it for my branch newsletter. 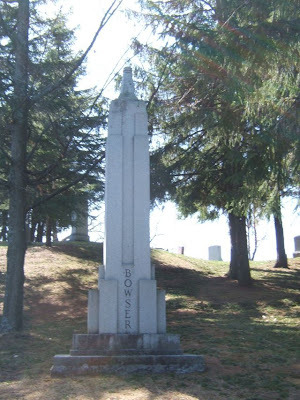 The man the monument is for (John Bowser) was the building supervisor for the Empire State Building. For some reason he has not been acknowledged as being part of the building, and I think this may have been his family’s way of getting even for that omission. They know I spend my time in the cemeteries when the weather is nice. I don’t think they have an opinion one way or the other. It’s just part of my interest in genealogy. I was looking around the internet trying to find more information on cemeteries, preservation of the stones, and the meaning of the symbols. That search uncovered the Grave Yard Rabbits. I had a look at some of the members sites and found them to be very interesting. I wanted to be part of the crowd. If you have an interest in cemeteries, this is the place to be. It’s a great place to be part of a group with a similar passion. It’s interesting to read what other people are doing and how they became enamoured with cemeteries and gravestones. Very nice to see another Canadian cemetery enthusiast in the Graveyard Rabbits. I hope to meet you in person some day. Thanks for all your volunteer work!